Seasonal changes may dictate some changes and buying certain equipment for your automobile. Aldi Catalogue has nice deals on auto care products such as car cover, car cooler/warmer, wheel clamp etc. See these products that will be needed later or now on pg 18-19 of the catalogue. All products are essential needs of car owners here. 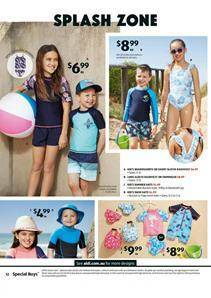 Swimsuits and beach products are available at Aldi on Saturday. Visit the store on 3 November for fantastic deals. Always with the extraordinary prices, Aldi has some advanced level of understanding of retailing something like this category. Go to pg 16-17 for an inflatable kayak, adult's wetsuits, towable float and more. Browse swimear for adults and kids on pg 12-15. Sets, hats, accessories and all other things were included in the catalogue.